"Having seen his two previous concerts in the great Nidarosdomen Cathedral (in 2003 and 2007) I certainly had high expectations for the show. The concert, performed before a sell-out audience of 1,200 was a triumph, a thrill of enjoyment, a magical experience, an once in a lifetime experience which I'm certain exceeded almost everybody’s expectations. Shivers down the spine and goose-bumps came, went and came back again throughout the concert. Jon possesses an unique ability to bring musicians from different musical landscapes and backgrounds together in a setting such as this, and then inspire them to perform outstandingly well. True magic! 1. To Notice Such Things, parts 1 through 6. The concert lasted 2 hours 30 minutes, and the time just flew by. The highlights were constant, though I'll give a special mention for Jon's new piece ‘To Notice Such Things’ – warm, melodic, and with great passages of drama and dynamics in between, an exceptionally fine version of ‘Soldier of Fortune’, and an almost unbelievably spine-tingling ‘Child in Time’ sung by Steve Balsamo. And every single artist on the stage shone through their various pieces – the orchestra with members from the Trondheim Soloists, and the Trondheim Symphonic orchestra under their conductor for the evening Mr Torodd Wigum, Nathalie Lorichs and Steve Balsamo were both magnificent on vocals, Martin the drummer from ‘Opeth’, Martin the bass player from ‘Opeth’, Magnus on keyboard, the wonderfully flute playing during ‘To Notice Such Things’ and the children's choir from Nidarosdomen. Fantastic – well done!" "From where we were sitting (front circle) I would guess the place was half full, certainly that was the state of the circle itself. Plenty of DP T-shirts and even a few of Simon's Sarabande shirts being worn so very much a Jon audience, though quite a few oldies in conventional classical concert wear too. We saw one or two people walk out early on downstairs leading Jon to quip "Nice of you to come" to one pair... followed shortly after by saying "...was it something I said?" as a lady flautist left the stage behind him between pieces to hand over to principal flautist Cormac Henry for To Notice Such Things. Poor lass was only on for The Telemann Experiment and had sat alone on stage prior to the off furiously practising the tricky bits as we arrived in the hall. We certainly didn't miss Steve B. and Miller Anderson made a worthy replacement. He may have looked a tad uncomfortable during the Concerto but we were both really pleased when Jon ended with Pictured Within as the final piece of the night - he sang that beautifully. I wasn't convinced by Jon's instrumental reworking of Evening Song on the To Notice Such Things CD as I missed Sam's singing from the original but hearing it played here I enjoyed it much more especially given the orchestra's leader's beautiful playing of the solo (I'm tempted to say 'lead') violin parts that have to some extent replaced the vocal line. I have to say it makes a huge difference hearing and seeing one of these orchestral shows played by a top orchestra, from a good vantage point in an acoustically good hall. Our central front circle seats gave us superb sound, you could hear and pick out every last instrument and so get the full detail of Jon's intricate writing. They PA assisted the orchestra for the Concerto and boy did both band and orchestra sound superbly powerful. I was worried the Concerto would sound dated and simplistic against Jon's more recent work but the sheer excitement and wide dynamics of the music were just a joy to listen to once again and Jon was on fine form tearing into the Hammond at times with some wonderful playing. It was amusing to see the more junior violin players craning their necks to peer over Jon's grand piano to see what he was up to at the Hammond during his solo moments. The whole place was on its feet at the end of the Concerto and deservedly so as both band and orchestra had been superb. Afterwards the queue running right around the circle bar area waiting to have CDs and the like signed was enormous. Jon, looking round at the length of it as we reached him for our turn, quipped "it's like Open All Hours in here" and as we left it still looked just as long so I wonder when he was able to slope of home? I'm not tiring of seeing Jon's post DP shows. The beauty, intricacy and heart felt honesty of his recent compositions are a joy to hear, a real emotional roller coaster at times and his present willingness to give the Hammond a good work out in his shows too means you get a bit of both worlds. (If only Ritchie would properly acknowledge his past in the same way it might be worth tripping out to see him again.) I've enjoyed seeing DP the last few times but it's always so samesy and has ceased to be "special" whereas Jon's shows have been quite the opposite." "The turn-out was disappointing but the music was fantastic. The first half was the Teleman Experiment, Evening Song (instrumental version) which was excellent - Jon described it as “a song to describe a warm summer's night drinking red wine”, then the six track "To Notice Such Things”. This is a very good piece of music, exceptionally played by the lead flute, and it was interesting to see how Jon had depicted the life of Sir John Mortimer. After the interval the original Concerto was performed. This is such a brilliant piece of music, a fight between classical and rock music, followed by the magnificence of the two playing together. Jon described it a “a love letter from a Rock band to an orchestra”. Miller Anderson stood in at the last minute and his vocals for the second movement were OK, but you could tell he was a bit out of his comfort zone. The Concerto finished with a standing ovation. To think this piece of music is 40 years old and still has the power, energy and detail to enhance a whole orchestra and give solos to a rock band stands testimony to the skill and craftsmanship of the composer. The guitar and drum solos were very good. To see the passion which Jon has for this piece of music and finally seeing and hearing all the intricate detail he plays throughout the piece was brilliant. The concert closed with the wonderful Pictured Within, sung by Miller Anderson, and was perfect in every way. It was a great night, and a real journey for the audience to go through. It was a pity that Steve was ill, meaning that there was no Child in Time and also that the venue wasn’t full - which meant that people missed out hearing one of our greatest living composers. Still, I had a massive smile on my face when I shook his hand at the end of the Concerto. God Bless you Mr Lord and may your work carry on for years to come." "What a night, having been at the Albert Hall in ’99 I had been hoping for a 40th anniversary Concerto – but it was not to be. Instead I had to wait for this – not the full Deep Purple line-up, but after the recent, premature loss of one of the Purple family, not one to miss. Surprisingly the gig was far from a sell out. The minute it was confirmed I’d booked tickets. The night started with a flyer in the concert programme explaining that Steve Balsomo was ill and would be replaced by Miller Anderson, a real plus for me as long as Pictured Within was featured. The night flew by with Mark Zyk making a particularly good impression of the man in black. Sat immediately in front of Jon I could see the passion he still retains for the Concerto and how much he was enjoying his new life outside the band. The night ended, following a superb performance of Pictured Within, with a never ending standing ovation. 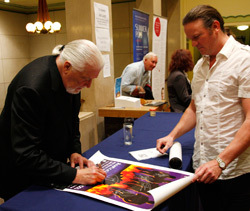 I’d taken a couple of posters with only Jon Lord’s signature missing in the hope that I could get them completed and so was delighted to see that he was doing a signing session at the end of the gig. At the interval I bumped into Paul Mann who was an absolute star – signing my Concerto poster and telling me where the band were meeting up afterwards, in case I missed Jon!"